"Big girls don't cryyy!" Take a gander at the first official photo from the Jersey Boys movie, being directed by Clint Eastwood (yea, really!) adapting the Tony-award winning Broadway musical that first hit the stages in New York in 2005. 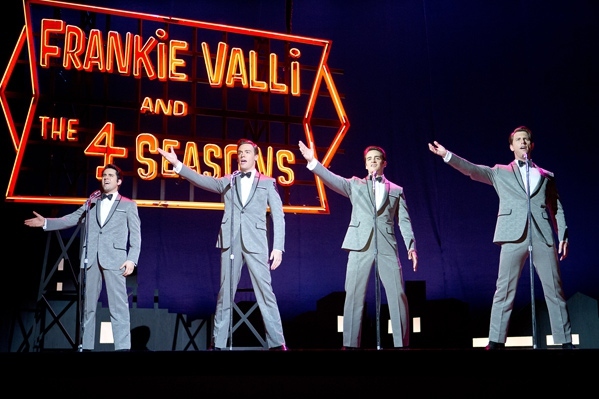 The big screen adaptation stars (most of these actors coming from Broadway) John Lloyd Young, Erich Bergen, Vincent Piazza, and Michael Lomenda as "Franki Valli and the Four Seasons", seen below. They're singing in front of a big lit sign, which is similar to the set design from the musical involving elaborate moving set pieces that help tell the 1960s-set story. A trailer is due out soon. Clint Eastwood’s big screen version of the Tony Award-winning musical tells the story of the four young men from the wrong side of the tracks in New Jersey who came together to form the iconic '60s rock group The Four Seasons. Their trials and triumphs are accompanied by the hit songs that influenced a generation, and are now being embraced by a new generation of fans through the stage musical. The story follows Frank Valli, Bob Gaudio, Tommy DeVito and Nick Massi. Clint Eastwood (of Mystic River, Million Dollar Baby, Gran Torino, Invictus, Hereafter, J. Edgar) is directing after Jon Favreau dropped out, with a screenplay by Rick Elice & Marshall Brickman. Warner Bros releases Jersey Boys in theaters on June 20th this summer. Not since BRIDGES OF MADISON COUNTY has Eastwood broken from his image this far. I look forward to this as a stalwart 4 Seasons fan. Maybe you could spell "Frankie Valli" correctly!